It’s easy to mistake daylily rust for streak disease, but experts believe that rust disease doesn’t survive in regions of North America with cold winters. However, if you find this disease in summer (usually on newly purchased plants), remove the plant from your garden, as it is highly contagious to other daylilies. The pathogen responsible is Puccinia hemerocallidis. 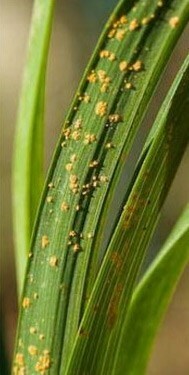 Small water-soaked spots develop on leaves and flower stalks, then expand into raised pustules, turning yellow with brown margins and finally, shedding powdery rust-colored spores. Only leaves are infected, not roots or crowns. Symptoms appear early in the season in zones 7-10 and later in the season in zones with cold winters. Following spore release, leaves turn brown and dry up. Rust symptoms may sometimes look like daylily streak disease, but if you draw a finger along the underside of a fully infected leaf, it should leave a smear of rusty orange spore powder, which is characteristic only for rust. Disease cycle: Rust diseases are very complicated. Daylily rust requires two host plants — daylily and Patrinia sp. — to complete the full life cycle that includes overwintering spores. Without Patrinia, rust disease can still spread very quickly among plants, but it is not as likely to overwinter in the leaves where winters are cold and daylilies go fully dormant. How this disease spreads: The spores are spread by wind, tools or the gardener moving among daylilies. Takes only 5 hours of moist, humid, 70-75°F (21-23°C) weather for a spore to penetrate and infect a new leaf. Symptoms are visible in 2 to 3 days. Infections spread quickly from leaf to leaf and plant to plant. Controlling rust: Avoid overhead watering. Remove and destroy any Patrinia plants in the garden. 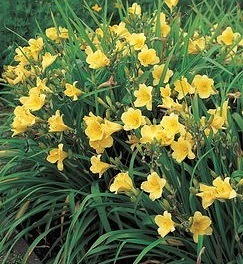 Dig up and remove any infected daylilies and either burn them or put them into trash bag and send them to a landfill. Do not compost. Using fungicides for this disease is not practical for the home garden. Even though rust is unlikely to survive in the plant over the winter in zones 6 and colder, an affected daylily can infect other plants so quickly that it’s best to destroy diseased plants as soon as possible. If you live in the US and you suspect you have daylily rust or want to know if it is in your area, contact your state plant pest diagnostic laboratory. Moderately susceptible: Butterflake, Condon, Crystal Tide, Gertrude, Happy Returns, Prelude to Love, Joan Senior, Prelude to Love, Rosy Returns, Star Struck, Stella D’Oro, Summer Wine, Wilson’s Yellow, Hemerocallis fulva. Very susceptible: Attribution, Buttercup, Catherine Woodbury, Cherry Cheeks, Colonel Scarborough, Couble, Crepe Eyed Ruffles, Double Buttercup, Flower Shop, Hello Sunshine, Imperial Guard, Irish Ice, Karie Ann, Lemon Yellow, Little Gypsy, Vagabond, Lonesome Dove, Ming Toy, Pandora’s Box, Pardon Me, Patience Plus, Pink Beacon, Quannah, and Rosie Pinkerton, Royal Ebony, Russian Rhapsody, Silken Touch, Siloam Doodlebug, Siloam Ralph Henry, Solomon’s Robes, Splendid Touch, Springtime Treasurer, Violet Explosion, White Wow, and Woodland Romance. Tolerant or resistant: Age of Gold, All-American Hero, Antique Rose, Barbara Mitchell, Butterscotch Ruffles, Catherine Neal, Creole Blush, Dainty Designer, Devonshire Cream, Ed Brown, Fashion Design, Femme Fatale, Gentle Rose, Golden Mandy, Happy Returns, Heartfelt, Holy Spirit, Joie de Vivre, Joleyne Nicole, Lavender Bonnet, Lilac Lady, Mac the Knife, Mae West, Meadow Sweet, Neon Pink, Pink Flirt, Prairie Blue Eyes, Raspberry Splash, Siloam Bill Monroe, Siloam Double Classic, Siloam Urv Winnifors, and Yangtze.